I got up at 7:30am, excited. Finally, the big day was here. I was out my door at 8am, and a short train-ride later I was at Circular Quay by 8:30am. Just before 9am I got on a ferry, and at 9:30am I got off at Manly. 15 minutes later at 9:45am, after going to the toilet and putting on some sun-screen, my journey began from Manly Wharf. The Sydney CBD was about 17 kilometres (11 miles) away, beyond Sydney’s lower North Shore and the Sydney Harbour Bridge. Could I walk all of the way back there? Yes, this stems from another new year’s resolution for 2014: see more of Sydney on foot, by taking long walks most weekends. Fortunately, I’ve always enjoyed walking and I especially like walking through Sydney. As I’ve mentioned in past entries, several years ago when I worked in North Sydney I often used to walk the 5-kilometre journey home, the best part of which was crossing the Sydney Harbour Bridge. In particular, I’ve also enjoyed a few walks through Sydney’s picturesque lower North Shore in suburbs like Neutral Bay and Cremorne. It was after the last of those walks a few years ago that I began wondering about doing longer walks. In fact, one of the reasons that inspired me to get my iPad back in early 2012 was to make myself more mobile for long walks – I could take that instead of lugging along my laptop PC for when I wanted to read, write and surf during stops along the way. But as with several other plans I considered during 2012 and 2013, I never got around to doing any long walks. Recently, though, as 2013 drew to a close and I became fed up with being fed up, I decided to make another resolution along with taking more action against my hoarding. Saturday, 4 January 2014 would be the starting date for my long walks. And I would begin with a big one. Or at least see how far I could make it. As the big day approached, I was both excited and cautious. I was excited about the prospect of enjoying the walk itself and achieving a major goal. Yet, I was also cautious for several reasons – I’m not in the best of shape; it would be a very long walk; Sydney is in the middle of a summer heatwave; and Sydney is also full of hills. So I hoped for the best but prepared for the worst – cutting my journey short and getting home by public transport. But even so, if I didn’t walk all the way back at least I’d made a start. As the days passed, I planned and counter-planned but left some room for leeway. And on 4 January itself, my plans began changing even before the walk began. I had decided to leave home as soon as possible without breakfasting. This was partly to save time, but also because I’m not much of a breakfast person. Setting off on a 17-kilometre walk without breakfast could be a problem, though, so the night before I’d bought a box of muesli bars along with the 1.5-litre of water I’d be taking in my backpack. 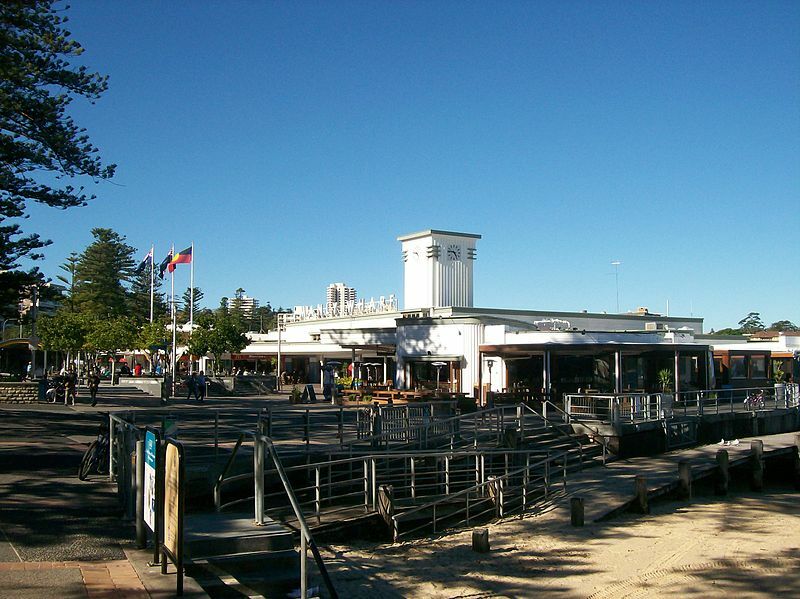 I could start eating bars as I began my walk, or even on the ferry to Manly – and of course, if I ever got very hungry during my walk, there’d be no shortage of places to eat on the lower North Shore. But then I unexpectedly arrived at Circular Quay with half an hour to kill before the next ferry arrived, so I changed my mind. I bought a couple of sandwiches and a Diet Coke, and before and after I got on the ferry I had breakfast. It wasn’t particularly enjoyable – partly because I like relaxed meals later in the day, and partly because the so-so sandwiches had cost $8.50 each – but I was eating mainly for practical reasons anyway. What did make up for it was the view outside. Traveling on a Manly ferry on a brilliant summer’s morning is a great way to start a day. 9:45am, just outside Manly Wharf. I blew my nose, threw the tissue in a public bin, and looked west past the foreshore buildings of Manly and the first kilometres of peninsulas that lay beyond. I adjusted my hat and backpack, smiled and began walking.